Acid soils result in serious and significant losses in production on Australian farms. Figure 1 highlights the varying degrees to which Victorian soils are affected by acidity. Acidity not only affects the farming land itself but can result in off-site impacts that affect the wider community. With increasing acidity causing reduced plant growth, water use by the plant population is likely to decrease, increasing the risk of salinity. Increased run off, removing water soluble nutrients and possible soil movement due to erosion can have detrimental impacts on streams and water quality. The increase in nutrient leaching due to the decreased water use by plants may pollute ground water. The leaching of nutrients and increased availability of clay minerals such as aluminium and iron can result in soil structure decline with irreversible damage. Clay soils will no longer have the characteristics of a typical clay, being quite plastic, rather they may appear to crumble. Monitoring the acidity level of your soil by measuring the pH level and applying lime strategically, should be part of routine farm management. This should ensure that the pH is maintained above critical levels. When the pH drops below 5.0 (CaCl2) in the pasture system, productivity starts to decline. Acid soils will restrict root access to water and nutrients. Figure 2 indicates the availability of plant nutrients at varying levels of soil acidity. 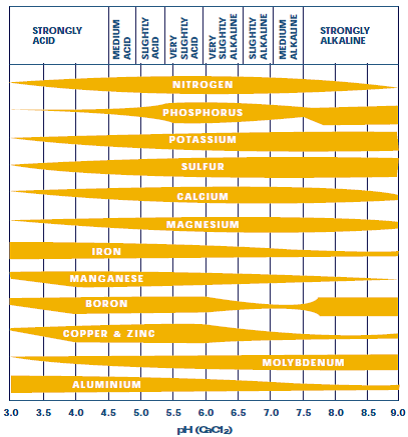 When soil pH drops, aluminium generally becomes more soluble, compounding the problem. As low pH affects microbial activity, some pasture legumes may fail to persist due to the inability of rhizobia to successfully nodulate roots under these conditions. Manganese can also become toxic as pH continues to drop, resulting in further pasture decline. Soil acidification is a natural process that is accelerated by agricultural practices. Improving soil organic matter levels has many benefits for the agricultural system, but also will also increase the soil pH over time as microbial activity breaks down the organic matter to humus and humic acid. Using nutrients, in particular nitrogen, can have acidifying effects on the soil. The greatest acidifying effect is not utilising the extra feed that is grown by the additions of nutrients. The extra feed that is not utilised, becomes organic matter and slowly breaks down to humic acids. Most plant material is slightly alkaline, so continual removal of plant material off the farm (removing calcium, magnesium and potassium in particular) either via hay or silage making or by grazing will slowly acidify the soil over time. Hay, especially Lucerne hay and legume crops can be major contributors to acidification. Grazing has a lower impact due to many nutrients being returned via urine and dung. Soil type impacts on the rate of soil acidification – pH drops faster in sandy soils. Clay soils have a greater cation exchange capacity and a greater water holding capacity, and so, buffer better against soil acidification.Higher rainfall areas will have faster soil acidification rates as the higher rainfall can increase the rate and intensity of leaching the alkaline nutrients (magnesium, potassium, calcium and nitrate nitrogen) down the soil profile. The higher use of nitrogen fertilisers and the removal of higher levels of farm produce per hectare (particularly grain and hay) will increase the rate of acidification. Liming is the most economical method of addressing soil acidification. The amount of lime required will depend on the acidity of the soil, the quality of the lime being used, and the soil type. Note: the lime rates calculated assume a pure limestone product. The neutralising value of a lime is expressed as a percentage of pure calcium carbonate which is given a value of 100%. With a higher neutralising value, less lime can be used. Lime with a higher proportion of small particles will react more quickly to neutralise the acid in the soil. Using tolerant species or varieties is only a short term option. Table 1 indicates the acid tolerance of some common pasture species. Although you will get improved production in the short term from these species compared to plants with a lower tolerance, the soil will continue to acidify with associated consequences and eventually may become too acidic for these plants also. Apply fertilisers wisely. Apply at a rate that matches plant requirements.